Note: This is a temporary workaround while the Shopventory team works to get a more elegant, purpose-built solution to tracking food expiration. Employees will have to be trained to select the oldest lot first when checking out a customer (assuming you want to sell first-in—first-out). Every time a lot is received, simply create a new variant. Once a variant reaches a zero quantity, it can be deleted. 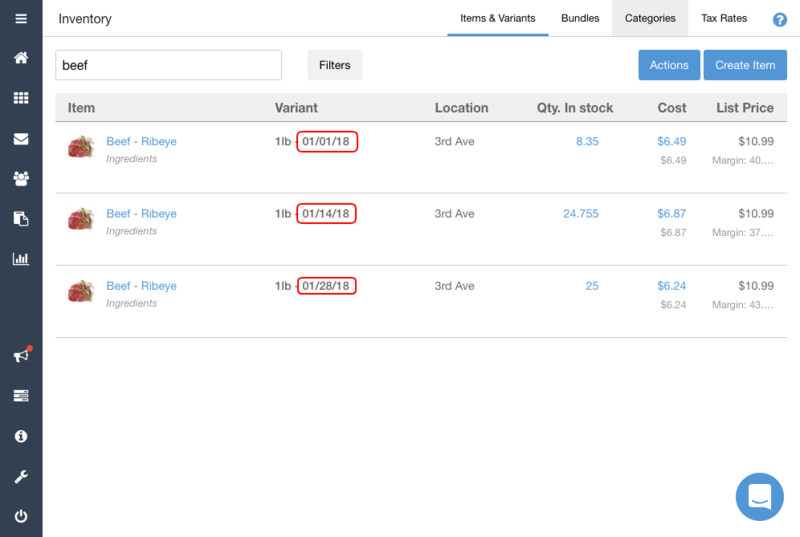 Shopventory will still have all the Inventory History and Sales History in the Reports. "Sell" the units for $0.00. — That will count the losses on the Sales Report. Deduct the inventory using the "Actions" button on the Products & Variants page. That will count the edits on your Inventory Change Report. This workaround would require you to update Bundles every time a lot is received, so it's not recommended if you have a lot of different Bundle recipes. You can still do it, it's just a lot of work. Let us know if you'd like to receive updates on a dedicated expiration dates function. Just start a chat and one of our Customer Care Team members can tag your email.